Check out this 3D multi layer Valentines piece! It is hand painted with perfect color combo of your choice and custom wording of your choice. We top it off with a multi-layered bow with pops of pink, red, white, and black. It is a bold statement piece for Valentine's Day. If you would like to change the colors, please note that in the notes to seller box. This is the perfect piece for any wall or door. This is made on 1/2 birch wood, hand painted, sealed, and with a metal wire for hanging straight out of the box. 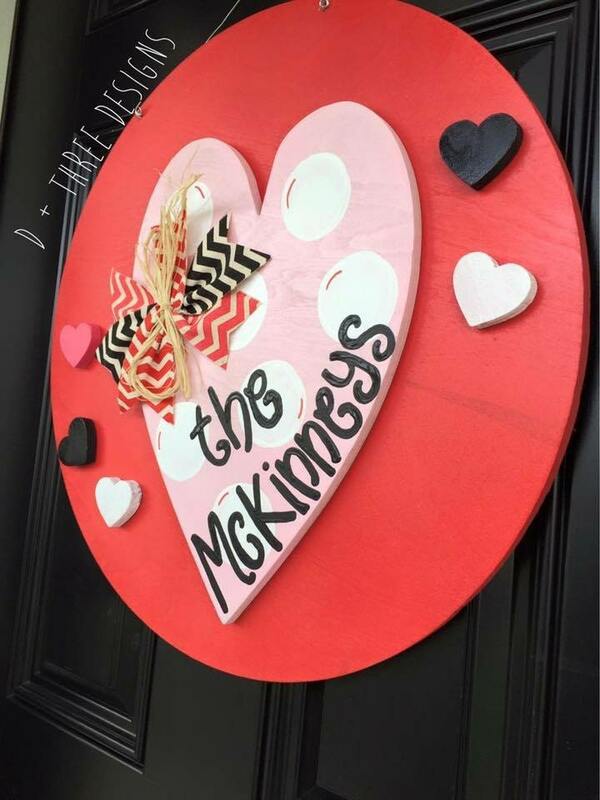 This monogram heart door hanger measures approximately 24" tall. It is LARGE! Please allow 1-2 weeks for us to ship out your order! We absolutely LOVE custom order. Have an idea or want something you do not see in our shop? Message us and we would be happy to make it for you! Payments are due upon order. Order processing does not begin until payment is received. D + Three Designs does not accept cancellations after the date the order is placed because order processing, customization, and creation begins as soon as possible after payment. As soon as payment is received your order will be added onto the list of orders to fill. Allow up to 2 weeks for your order to be made. I have rush order option (for an additional fee) available and this will jump you to the top of the list with your order typically shipping out within 48 hours of payment. Items are carefully packaged in order to ensure they arrive safely to the buyer. All orders are made to order and do the process doesn't start until payment is received. Orders are currently shipped within 1-2 weeks of receiving payment. Your custom item will be shipped Monday- Friday with Fedex or USPS. If for any reason your package is returned to us, a reshipping fee will apply. Thank you! If your package reads as shipped & delivered, but you have not received it yet please let us know. Typically the package will arrive within a week of shipment. Please contact us immediately if you have any questions or concerns. All sales are final due to the fact that each piece is custom made and created to fit your preferences. D + Three Designs is unable to refund money on items sold in our shop. All items are carefully packaged however, if an item is received broken, a photo is required of the damage for us to re-cut the item. Please notify us immediately about any errors with your order. Before purchasing, feel free to ask us for a proof so you have an idea of what the letter(s) will look like. ALL SALES ARE FINAL. We will not issue a refund (or recut the item unless a mistake has been made on our part or a production mistake has been made) because you do not like the letter appearance after you receive it. Upon purchase you agree to these terms. Custom orders are always welcome. D + Three Designs loves to make personalized orders and fulfill specific requests. Send us a message to inquire. When ordering, Include the order of the letters you want us to cut. We will cut the letters in THE ORDER YOU PROVIDE SO THIS IS VERY IMPORTANT. To simplify the process, and time in processing PLEASE only give us the initials in the ORDER YOU WANT LEFT to RIGHT. (S)arah (E)lizabeth (D)enton, so we know exactly how you want the monogram to look. Orders are custom cut as received so please allow us up to 1-2 weeks to make and ship your order. Due to all Monograms being custom made and they are NON-RETURNABLE. Thanks and we look forward to doing business with you!